Bamboo stick We believe that our bamboo stick is your best choice. 2. All raw material selects from the most hard part of bamboo to ensure that the skewers is very hard and not easy to break. 3. Process by boiling, degreasing, antisepsis, anti-mildew, steam dried,cutting, polishing, sharpening, strictly select to ensure excellent bbq skewers. 4.Diameter: 2.5,3.0,3.5,4.0,5.0 mm available.length:12-50 cm,customer can have a rich selection of size and pattern. 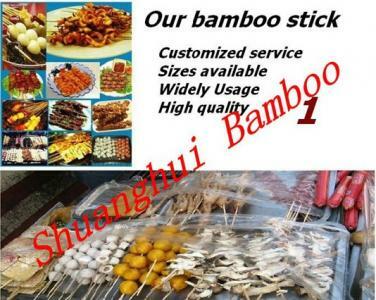 Bamboo stick usag:mainly used for BBQ,barbecue,Picnic .